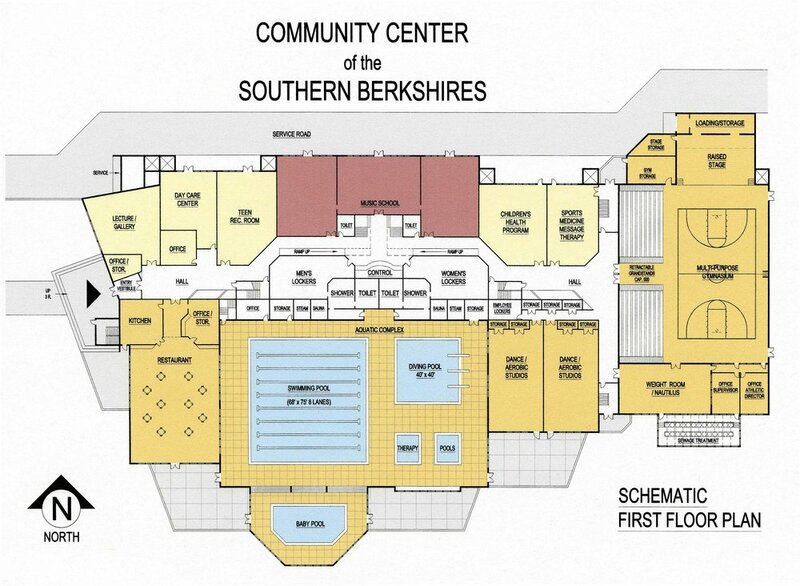 From a needs assessment study for the Southern Berkshires, cost estimates for a new building and schematic design drawings were developed to be built on a sixteen acre site provided on the outskirts of Great Barrington. The children and youth of our area have no central gathering place for recreation, after school education, cultural programs and many sports. The senior citizens of our region need a place to meet that will bring them into the community at large, and also provide a place that enables participation in life extending, healthful exercise. The complex features a competition swimming pool, a therapy pool, and included a gymnasium, skating rink, restaurant, youth and senior centers, a multipurpose/theater space, various arts and crafts and athletic and educational activity rooms. The most important aspect of this facility is that it will provide an umbrella organization capable of bringing together some already existing educational, cultural, recreational, health care and social service organizations as well as some established programs for children, youth and elderly citizens. The proposed new facility will house various existing community sports programs as well as educational and cultural events. It will also provide a "home" for several health related businesses in the area by building commercial condominium units within the facility. The functional mix within the Center will encourage athletic and social activities that will provide our community with a much needed, family oriented alternative to the "mall". Structurally, the organizational relationships will be similar to a "shopping complex", where each "unit" is separately owned or rented but a common facility is shared by all. In our building, a number of the spaces will either be separately owned condominium units (legally separate tax lots within the facility) or leased (for a nominal user fee) to existing nonprofit groups for their programs. As separate tax entities, the condominium (or co-op) units will be owned and operated separately and will pay maintenance or user fees to the Community Center umbrella organization for its facility operation costs. A board of directors, consisting of the various owners will have jurisdiction over the entire facility. The nonprofit umbrella organization will have direct administration responsibilities only over that part of the center which it "owns". These areas of the center will likely include an Aquatic Complex, a Gymnasium along with associated locker, shower, and toilet facilities. Other spaces that could be leased for nominal or no fees by outside organizations would be a Toddlers Preschool Day Care/Playroom, a Teen Game/Recreation Room with offices for counseling and a Senior Lounge/Activity Area. This organizational structure of the proposed Community Center will avoid the constant necessity for the umbrella organization to raise funds each year to maintain the facility. In addition, the proprietary interests of the condominium unit owners will ensure that building maintenance and service to the public will be at the highest level possible at a community facility. The most important function of this Community Center is to provide our children and elderly citizens a communal gathering place where entire families can become involved in various charitable, educational, cultural as well as recreational activities. A full spectrum of additional cultural, educational and recreational activities within the Center will encourage the participation of entire families while also ensuring the financial viability of such a center. The focus of the building, both conceptually as well as architecturally, will be the swimming area. As a form of exercise, swimming is the most beneficial activity to the widest spectrum of participants, from an infant of a few months to the oldest senior citizen. The benefits of swimming, as a form of non-weight bearing physical activity, used to combat a variety of ailments & conditions as well as recovery from injury are well documented. As a medically recommended way to combat arthritis, osteoporosis and rehabilitate injured joints, swimming has become a way to literally reverse the aging process. It is becoming an increasingly recommended post operative recuperative procedure. The inclusion of existing South County health and fitness related establishments would lighten the burden of facility maintenance while also enhancing the quality of the programs for the nonprofit "umbrella" that would govern the Center. These commercial units would join the center together, as condominium owners would provide important financial help with operating funds, while also providing built-in owner incentives to maintain a high level of upkeep at the center. To assure a nonprofit status for the center as a whole, any surplus of funds available from the commercial "for profit" segments, would be channeled into improving programs, the facility itself, or adding to the salaries of the paid "center" staff. This dual aspect of the center would help maintain the highest quality of available staff. Built with non toxic, recycled materials as much as is feasible, the Center will be a showcase for energy conservation and use of renewable energy sources and will serve as a model for waste recycling. Passive solar design, with a geothermal heating system and, if feasible, photovoltaic panels and wind energy used in the building, will all become community teaching tools available to all schools for the sane and responsible use of our natural resources. A prominent feature of this building, designed as an organizational focal point, will be the indoor "Piazza". This plaza will serve as a gathering place for people of all ages, similar in design to such public places as the famous piazza in Sienna, where musicians gather and entertain people sitting at the open air cafes sipping coffee. It will also act as an orientation space for the building and will feature special lighting designed to combat SAD (Seasonal Affective Disorder). This disorder, prevalent during the winter months in the northern latitudes, has become widely publicized in the last decade and is largely responsible for many forms of depression. The proposed building will be designed to minimize its impact on the site, keeping maintenance costs at a minimum, while maintaining maximum use of open space, given the size and complexity of the project. From a planning point of view, the center hopes to reinforce principles that support the reinvigoration of the town center. Public, private, and both vehicle and pedestrian transportation availability is also an important consideration that would also favor an "in town" site for the facility.